Martyn Hilbert's Railway Photography - BR Blues - 47089-'Amazon' at Lostwithiel. 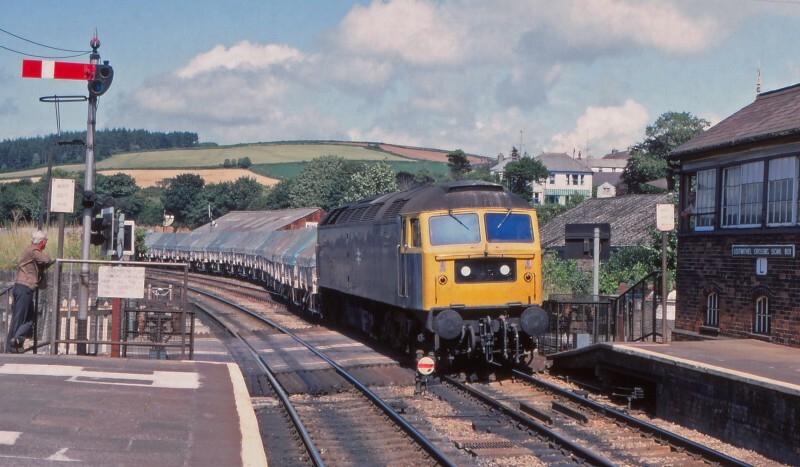 Watched by the signalman from the box at Lostwithiel, 47089 -'Amazon' gingerly brings a rake of loaded Clayhoods onto the Cornish Main Line on July 31st 1980. The loco is passing over the level crossing that takes Grenville Road across the line. Lostwithiel is the junction station for the Fowey Branch, closed to passengers in 1965 but kept active with China Clay workings to the Docks. 47089 was one of the original batch of Western Region named 47s, the loco was new from Crewe Works in April 1965 as D1675.